As the end of March neared, the 3-month Treasury interest rate surpassed the 10-year Treasury interest rate and this resulted in a 3-month/10-year inversion of the yield curve, the first since 2007. This inversion has unwound as the curve has started to steepen with a move higher in the 10-year yield. At HORAN we focus more on the 2-year rate versus 10-year rate and this portion of the curve has yet to invert. Investor focus on the yield curve is due to the fact when spreads between short- and long-term rates narrow it is an indication that economic growth will fall in the future. Typically, when the curve begins to flatten and invert the 2-year/10-year inverts before the 3-month/10-year. The heightened focus of the yield curve inversion is the fact an inversion has occurred prior to each recession since 1970. 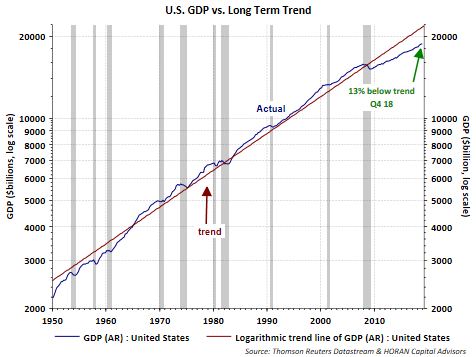 The recessions, however, were not immediate and both the market and economy tended to perform well over the subsequent 12-18 months following an inversion. Nevertheless, with the 3-month/10-year inversion, heightened commentary around the end of the economic cycle has ensued. 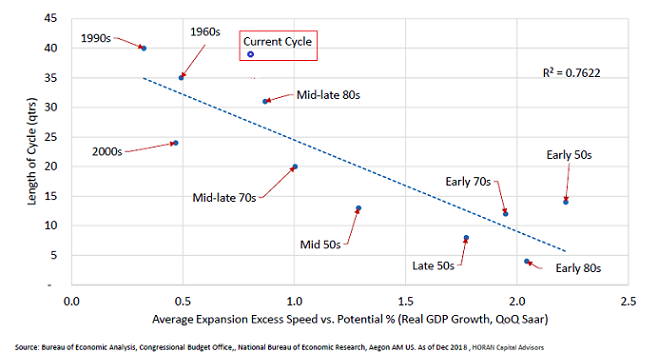 Influencing the 'end of cycle' discussion is the fact the current economic expansion is near the longest on record. July will be the record breaking month. Importantly, economic expansions tend not to die of old age but of excesses. One characteristic of this expansion has been the fact the growth rate has been below the long run economic growth rate of prior cycles. The below chart shows the gap in output as a result of the sub-par growth. One silver lining with this slower pace of growth is the fact economic cycles tend to run longer if the pace of growth is below its long run potential. Below is a chart by Aegon Asset Management's D. Harris Kere, CFA that shows the length of the economic cycle relative to the growth rate and long run potential. 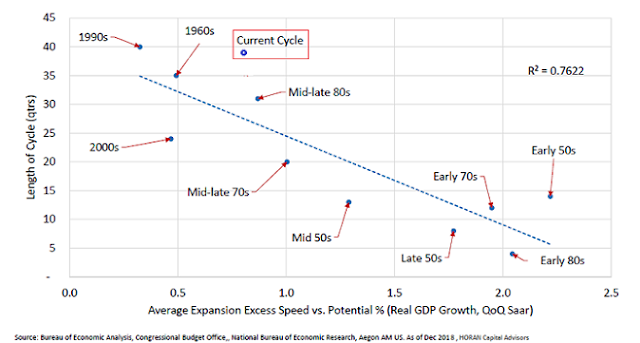 In prior economic cycles where growth was below potential, the cycles ran longer. The current expansion is exhibiting a similar characteristic. "Most financial commentary comes without any assurance about the presenter or the quality of the research...After extensively reviewing many recession warning systems, I have one definite conclusion: None of them is useful beyond a period of a year. Predictions are especially unhelpful when they include a general warning based upon pop economics or confirmation of investor intuition." None of this is to say ignore the economic data as the major market declines do tend to occur around recessions. However, more factors influence market action than just the economic data points that are released on a weekly basis.